Well played, Marvel Studios. Well played indeed. I continue to be impressed with how well-produced Marvel's movies have been since they set up their own shop to make films. I'm not saying I'm dissatisfied with the X-Men and the Spider-man movies, but I actually wouldn't at all be unhappy with a relaunch (yes even another round of relaunches) on these fronts if and when these licenses make their way back to Marvel's hands. For all I know the Guardians of the Galaxy movie could still be, well, a flop. But I have to give Marvel applause for the trailer in that they so clearly know how to market a movie--even a movie with characters this obscure--to an audience. If the trailer is any indication, they know what they're doing making this movie and they know how to give even relatively unknown characters enough love and attention to make you care. My impression is that Guardians of the Galaxy is going to give us just enough tongue-in-cheek humor for us to forgive and accept just how out there (even by Marvel Comics standards) it is. And it's a great move. It gives the movie (or at least the trailer) a little bit of flavor that's relatable and accessible, so you aren't just taking in some wild outer-space chase that doesn't make much sense. So I'm expecting it to be funny. And hey, there's no reason to mince words introducing the characters. Nothing too contrived; the audience literally gets a run down of each Guardian in the trailer. Which is fine because hey, most people don't really know much about who they are. So it makes sense to do it. But what I love the most? It seems like this most recent incarnation of the Guardians are criminals. They may be good guys in the end, but this is essentially a movie about a bunch of good guys on the wrong side of the law. These aren't the Avengers. Hell, these aren't even the X-Men. It's an impressive feat, really. Take a bunch of no-names and make it seem like they're actually the coolest, craziest and most out of control superheroes on the block. You do get the impression though that this movie is going to be Star Wars meets the Usual Suspects in a very cool way. I mean, I suppose this isn't new news. Marvel has been teasing us with shots of a line-up for a while. But for some reason, seeing the trailer really seemed to make it sink in. 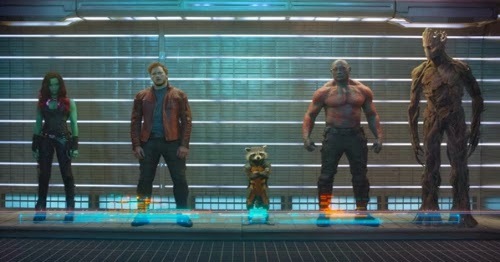 The Guardians are wanted fugitives. They're outlaws. Maybe (likely) they're going to have some cause that does, or will, bind them towards something good, but these are the kind of guys who sneak out of prison, who start fights in some intergalactic bars and basically who you don't want your children associating with. It looks...like a great movie. I'm cautiously optimistic here. Anyone else want to chime in?